What Day Of The Week Is July 1? 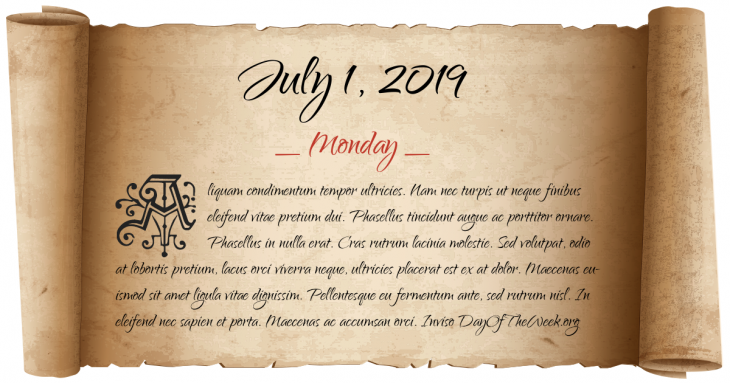 July 1, 2019 is the 182nd day of the year 2019 in the Gregorian calendar. There are 183 days remaining until the end of the year. The day of the week is Monday. The end of this day marks the halfway point of a leap year. It also falls on the same day of the week as New Year’s Day in a leap year. The British North America Act of 1867 takes effect as the Constitution of Canada, creating the Canadian Confederation and the federal dominion of Canada; Sir John A. Macdonald is sworn in as the first Prime Minister of Canada. General Order 70, the culmination of the Cardwell and Childers reforms of the British Army, comes into effect. Flooding of Canada’s St. Lawrence Seaway begins. Ghana becomes a Republic and Kwame Nkrumah becomes its first President as Queen Elizabeth II of the United Kingdom ceases to be its Head of state. The Wonderland Murders occurred in the early morning hours, allegedly masterminded by businessman and drug dealer Eddie Nash. The first operation of Qinghai-Tibet Railway in the People’s Republic of China. Who were born on July 1?